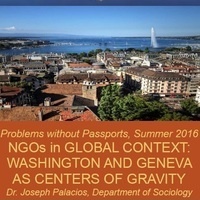 The NGOS IN GLOBAL CONTEXT program offers students behind-the-scenes visits to UN agencies, international organizations, and NGOs based in Geneva and Washington; access to public officials; and, insights into NGO processes, policies, and strategies. Students will also network with practitioners and academic experts through workshops, simulations, trips, cultural activities, discussions, and classroom lectures. The NGOS IN GLOBAL CONTEXT counts as four (4) credits for USC students. Students in the NGO and Social Change major may use this course as fulfillment or extension of the Practicum (SOCI 450) requirements. A SECOND SESSION takes place at 5-5:45 P.M. in the same location.